Folks, there's just about a month left for Christmas. Can you believe that? I spend all year waiting for Christmas to come around, which, honestly must sound crazy to a lot of people. I don't know what it is about that time of the year, but seeing everything lit up and decorated, the dizzying levels of activity in my home, just the joy of family gatherings, meeting friends and gift giving makes me feel all warm and fuzzy inside. So I'm glad the wait is almost coming to an end. Sift the flours into a mixing bowl. Add the sugar and lightly toss around to distribute the sugar evenly. Rub in the cold butter and knead into a soft dough. Place the dough into the moulds and press gently but firmly to fit neatly. If using the shortbread moulds, line baking sheets with baking parchment and invert the moulds onto the sheet and tap firmly to release the dough. If using a pie dish, simply press the dough into the tin and smooth the surface using the back of a spoon. Prick all over with a fork and score into eight wedges using the back of a knife. 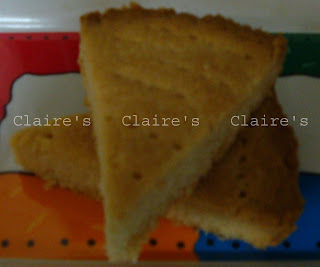 You can make the wedges smaller if you like, since it is a rich cookie. Bake for 35-40 minutes, until pale golden in color. Leave it in the tin till it cools a little, just cool enough to handle. While it is still hot, carefully unmould and re-cut the wedges. Don't forget to visit the other participants and see what they've made this week! Give it a try ... it comes together fairly easily. Whats more difficult is waiting for it to bake and cool!!! Oh no, get better soon. Shortbread is one of my Christmas mainstays. I drizzle melted chocolate over them and get rave reviews. We love shortbread here, too! I made it for the first time last year, oh so good. I hope you're feeling better soon! Thanks guys ... feeling a lot better today. Can't wait to get back in the kitchen! I wait around all year for Christmas too! Glad you are feeling better..thanks for the recipe! Can't beat shortbread for Christmas! Hope your feeling better real soon! I love shortbread! This looks delish! Hope you feel better soon. I've had Scottish shortbread and it is SO good. It was in a Holiday Cookies baking class I took, so it is definitely perfect for that! My very first Award .... yippee!! !